The first College Playoff Ranking came out and a one loss Notre Dame team couldn’t have come off in a better position. Blowout wins over ranked opponents (USC and NC State) along with a one point loss to Georgia has impressed the committee. But, there should be some caution in the wind, in part because of Notre Dame’s schedule. The schedule has been a blessing and could ultimately be a curse. Even though the Michigan State win is fading a bit, the Irish did go to East Lansing and beat the Spartans by 20. A 35 point win over USC and 21 point win over NC State has given the Irish plenty of style points but the remaining schedule is daunting. 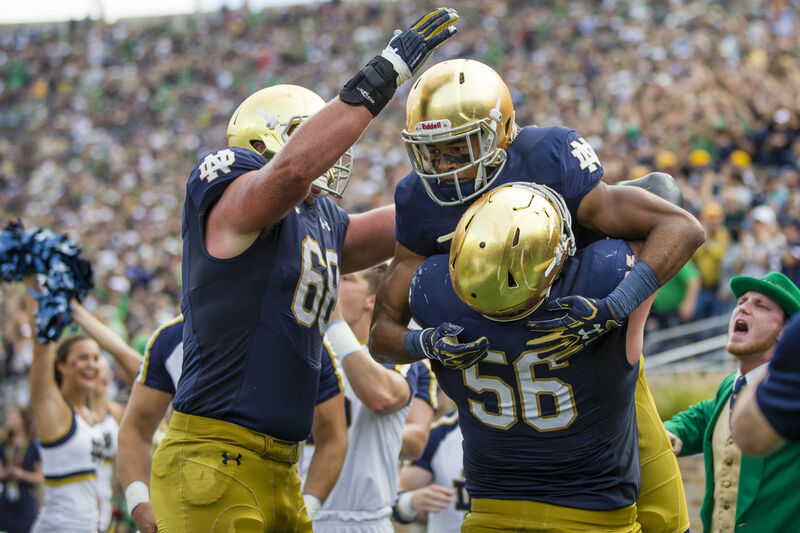 This week, the Irish are home to a much improved Wake Forest team. The Demon Deacons have slipped back on defense partially because their former defensive coordinator, Mike Elko, coaches at Notre Dame. Elko has made the Irish faithful forget about the defensive woes from last season. With that being said, the Wake offense still motors at a high rate. This was on full display in their 42-32 win over Louisville last week. Quarterback John Wolford threw for over 400 yards and 5 touchdowns. Wolford has thrown for 15 touchdowns and only 2 interceptions this season. Despite 181 pass attempts, he’s only been sacked 8 times. Notre Dame’s defense will have their work cut out for them this weekend. As if that isn’t enough of a challenge, Notre Dame heads to Miami the next week. The 10th ranked Hurricanes are still undefeated with a big game (Virginia Tech) over the horizon this weekend. The game against the Hokies starts a three game home stand for the Canes. They will not be short of motivation and they should be well rested. They are battled tested having won their last four games by one score. There’s no panic in this team when the game is close, just ask Florida State. After the South Beach trip, it’s a back home for Navy. The ultimate game of assignment football. The Mids defeated Notre Dame last season but that seems like a millions years ago now. With that being said, you know what you’re getting out of Navy. You’re getting 60 minutes of tough football with a dash of never say die. This could cause a problem even if the Irish jump out to a big lead. Navy is very good at not diverting outside of their comfort zone even when they’re down on the scoreboard. This causes problems for Mids’ opponents who want to cause Navy to pass the ball. Quarterback Zach Abey is slated to play this weekend after suffering a concussion last week against UCF. If the Irish makes it through that gauntlet, they have Stanford waiting for them out in Palo Alto. The grinding run game, led by Heisman Candidate, Bryce Love. After two early season losses, the 21st ranked Cardinal have run off 5 straight wins including a road win at 20th ranked Utah. If a playoff birth hangs in the balance, what better impression could the Irish make on the committee? Beating a big, physical top 25 team on the road should do the trick. So as the Irish briefly bask in the glow of their number 3 ranking, the landmines have been laid to derail their trip to the playoff. But, if their is one thing the Irish have proven this season is they are as mentally tough as any Notre Dame team has been in the last 10 years. A far cry from last season’s 4 win team.